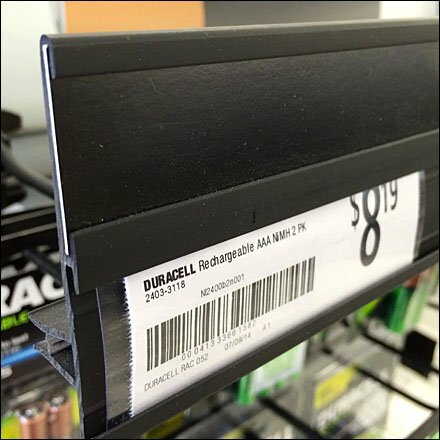 Multi-Channel Label Strip can be used for additional product and price information, signage, category delineation or branding as for these DuraCell® Green (for Eco-Friendly) Rechargeable Batteries. The Black extrusions also echo the Black and Green branded package designs. This simple Label Strip elevates the display and helps justify the Earth-friendly and cost decision to go rechargeable. CLICK the gallery to step through display views. Hooks are black painted Plastic Backplates with Black Powdercoated Frontwires.